Usually, I try to save my notes as to where I get my fashion plates that evolve into paper dolls, but I forgot this time, I’m afraid. 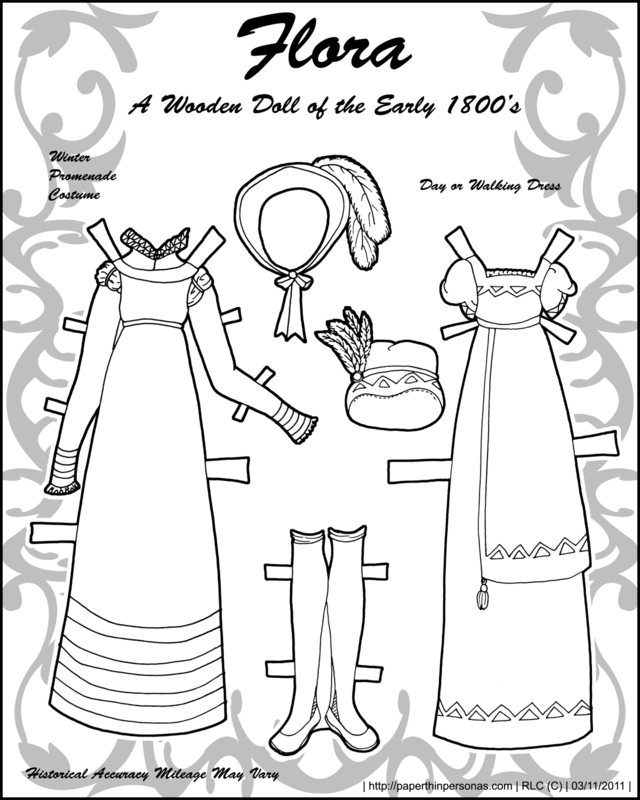 The dress on the left is a promenade costume and the dress on the right is a day or walking dress. I am realizing I haven’t yet drawn gloves for Flora and I should. When short sleeves were standard, the need for gloves was pretty serious. England is not, after all, the warmest country. So, I’ve got up a new poll, again, largely for my own amusement more then anything else. It’s a question I have always wondered about and now I get to know the answer. That’s a hard choice between Curves and Marisole, but curves won out. I think mainly cause I get to colour her myself, as well as the realistic proportions. Yeah, Sara, I’m surprised to see Curves winning. I always assumed, perhaps because Marisole generates the most comments, that Marisole would be the clear winner. Of course, it’s a little early to predict results, but I’m surprised by Curve’s early lead. So, this poll might be more exciting then I thought. It’s a tie between Flora and Marisole! Both have fabulous long legs!